The team presents one or two series every month with seven or eight plays as a combined effort. “Vaayusastra, which is headed by me, is a group aimed at combining techniques of aeromodelling with theatre in a format which is easily explainable to kids. 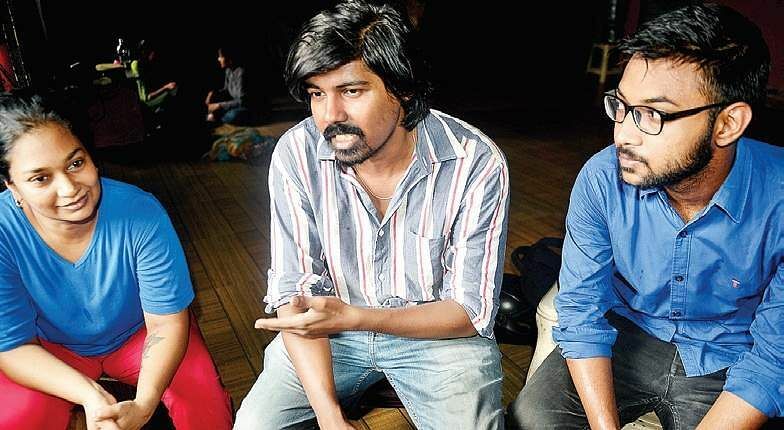 Since I am an aeronautical engineer who happened to be passionate about theatre, I tried to combine both the skills,” he adds.Naveena Koothupattarai, set up in 2014, is headed by Athira Pandilakshmy who is the most experienced theatre artist in the team, with more than nine years of experience. “Naveena Koothupattarai aims to combine old and new aspects of theatre in an agreeable fusion. We also nurture budding talent and help them grow as artists... If a play lasts 10 minutes, we give chances to college students and homemakers, but if it’s an hour long, we look for experienced full-time actors,” says Athira adding that her aim was to provide a permanent stage for artists so that they can practise regularly apart from only participating at festivals. Feathers series this year includes a team of five directors — Jagadeesh Kanna, Karthik Shridhar, Athira Pandilakshmy, Chandrashekar and Praveen and a long list of actors who have presented over 70 plays at the Short and Sweet Film Festival. Some of the names of their plays are in English but they all use Tamil language and cater to the local audience.